Venice, my fourth Flyday trip, short but intense! Left Brussels on Friday night 7.30pm and returned on Sunday morning 10.25am, just in time to run the Antwerp 10 Miles. As usual with the Flyday promo, the return flight was €99. The outbound flight on Friday was overbooked as the previous Brussels Airlines flight to Venice had been cancelled due to a technical aircraft issue. 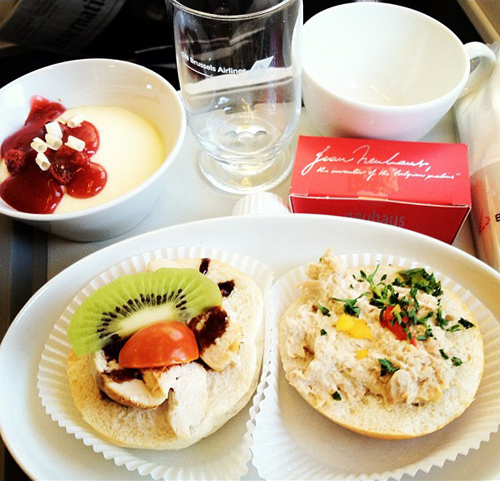 This resulted in a Business Class upgrade (better food!) for myself and four other passengers. At the gate, €250 vouchers were offered to passengers volunteering to take the next flight to Venice. I declined the offer, as my original trip was only 36 hours and I was traveling with a friend. So how was our stay in Venice? Wonderful! Sunny all day long, strolling along the canals and admiring the beautiful squares and buildings. People spotting at San Marco square while enjoying overpriced drinks. Listening to the Gran Caffe Quadri Orchestra for which a €6 per person ‘live music’ charge was applied to out bill. It’s all part of the Venice experience! 😉 All pictures in this blog post were made by my lovely travel companion, Sabrina. Great post. Definitely a place I’d want to visit. Going to Venice on May 🙂 thnks for sharing!